Grooming tables are a necessity for pet groomers, and custom grooming table covers make clean up more efficient. If you have a dog that requires a significant amount of grooming to keep him looking neat, it makes sense to invest in a grooming table and cover to save money and time. Grooming tables have flat surfaces and adjustable legs. The legs adjust in order to accommodate the height of both the groomer and the dog. Groomers can adjust the table height so the dog is at the best level for grooming. 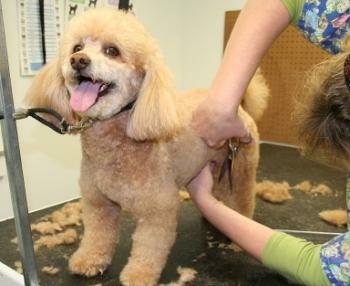 They can raise the table when grooming a small dog so the groomer does not develop back problems from stooping. Likewise, the table can be lowered in order to make working on a larger dog more comfortable. Table covers are similar to tablecloths in that they fit over the grooming table and drape down the sides. Custom table covers are measured to fit your specific grooming table and may be made of more luxurious materials. Custom covers are often monogrammed and usually reserved for doggie salons or are used at dog shows. Making a custom table cover is relatively simple if you choose not to monogram. If you do want a monogrammed cover, you can either embroider the wording by hand or take your completed cover to a local embroidery or monogramming store. Most commercial monogrammers will monogram items for a nominal fee, and you can choose from a variety of colors and fonts. Measure your grooming table's surface for both length and width. Determine how far you want the sides to drape and record that as well. Calculate the amount of material you will need by multiplying the length times width, including the drape. Fabric bolts are usually sold in either 45 or 60 inch widths so if your cover needs to be wider than 60 inches, you will have to sew two pieces of fabric together to get the correct width. Cut your fabric to the table's measurements, and make sure you include about one-half to one inch extra for a hem. Pin the raw edge down and iron flat to create a finished look. Stitch the hem closed with either a sewing machine or by hand. For a more professional look, add a trim or coordinating color along the hem. Once the hem is sewn in place, add your monogramming if desired. Depending on your needs, you could add your pet's name, your kennel name or the name of the grooming salon. If you do not feel comfortable handling the job or simply `don't have the time to make your own, there are some online retailers who offer custom covers. To order, you will need to provide the measurements of your table for both the table's surface area and how long you want the sides to drape. Since the covers are custom, there may be a lead time associated with your purchase. Take that into account and order early. Whether you decide to purchase a custom cover or make one yourself, take care that the fabric you use is durable and has enough grip to keep your dog from slipping on the table. Terry cloth is a great choice for this purpose, but take a look at the materials used by the custom manufacturers and base your choices on those. Even though a customized cover is often more about glamor than anything else, it should still be safe and functional.